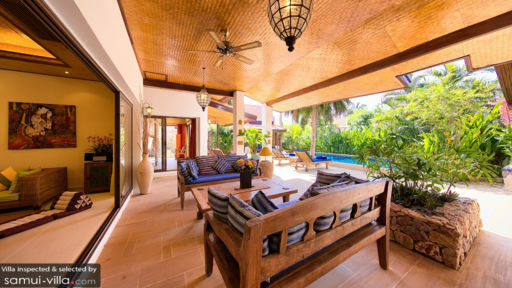 Villa Baan Buaa is a luxury beachfront residence that exemplifies fully contemporized tropical architecture, design and interiors. In both structures and furnishings, traditional influences are but touches and traces. 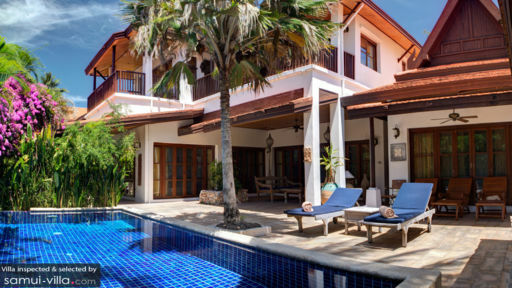 And more than a fusion of old and new, the entire villa is skewed towards current and present-day stylish living that is, at the same time, distinctively and unmistakably Asian. Villa Baan Buaa is truly an innovative showcase of what’s in, what’s now and, perhaps, of what’s next. There are two bedrooms on the villa’s upper floor. Both have king-sized beds, walk-in closets and dedicated bathrooms with dual sinks and rain showers. Both bedrooms also open out to furnished balconies overlooking the pool area, the beach and the open sea. A third bedroom is housed on a separate building on the ground floor. It has a queen-sized bed and a dedicated bathroom. 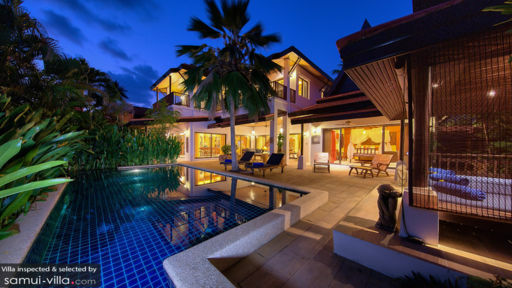 It also opens out to a furnished covered terrace and has direct access to the pool area and to an outdoor shower. Partially fringed by thick shrubs of tropical plants is the villa’s swimming pool. Wade in for a leisurely dip or for some playful splashing. Then, on the spacious sandstone deck, stretch out on the cushioned pool beds under the shade of a coconut palm tree for a sun tan along with the cool sea breeze. The villa has two living areas. The outdoor living area is set up under the covered terrace. On its cushioned benches you can all hang out for some spirited storytelling. Indoors, the other living area has large and long cushioned couches facing a big, widescreen TV. Here, you can all gather to catch the latest episode of your favorite show. There are also two dining areas. The indoor dining area has a table good for eight where the day’s scrumptious meals can be served right from the fully-equipped, modern kitchen nearby. The counter between the dining area and the kitchen can also double as a bar where all kinds of drinks can be prepared. Provided with high chairs, this is one other place to mingle and mix. Sliding glass doors open out to a covered terrace reserved for the al fresco dining area where you can hold an impromptu barbecue party. For some lazy lounging and me-time, you’ll surely find a comfortable spot under the semi-open sala at the far end of the swimming pool. A multilingual guest manager heads the villa’s staff. Regular services include daily housekeeping, breakfast and lunch prepared by a resident chef as well as 24/7 security. The villa concierge can also arrange spa treatments, Thai cooking lessons, grocery errands, car and bike rentals, as well as local tours. Right outside Villa Baan Buaa’s front door is the white-sand beach of Nahai located in Hua Thanon – a muslim village which is home to Koh Samui’s last remaining, elegantly painted kor le fishing fleets. By the side of the sea are restaurants that offer authentic Samui cuisine at really low prices. Must-see nearby attractions are the Hin Ta and Hin Yai Rock Formations, the Samui Aquarium, the Tiger Zoo and the Butterfly Garden.